Episodes of the 1-800-Flowers Undercover Boss episode from 2010 are still being broadcast, and it looks like they’ve redesigned Dee’s Bouquet for a third time. In my opinion, this third design is the best. Unlike past versions of Dee’s Bouquet, which something tells me were probably just previous designs that they decided to rename in time to make the TV show, this one was clearly designed from the ground up and really seems to capture Dee’s personality as it looked on the TV show. If you recently saw the rebroadcast of Undercover Boss, since the show was originally broadcast they’ve redesigned Dee’s Paradise to become Dee’s Tropical Paradise . 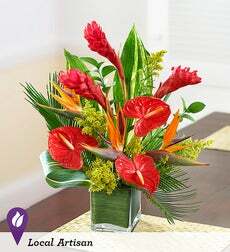 It’s a beautiful arrangement with roses, ginger, anthurium, Birds of Paradise, Ti leaf, palm leaf, and myrtle. Tonight’s episode featured Chris McCann of 1-800-Flowers, and a floral designer in Boston named Dee, who reminded him of the lesson that success in the florist industry isn’t counted by numbers of flowers you sell, but by how great a relationship you have with your customers. , has been named after her. 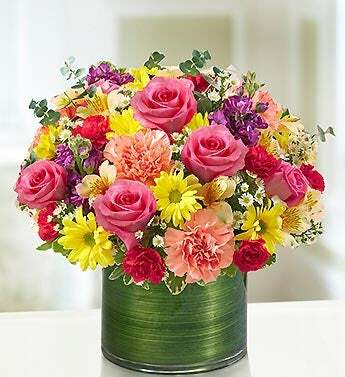 In addition, a portion of proceeds from sales of this arrangement will go to a scholarship fund for budding (no pun intended) florists and flower designers at the non-profit organization American Institute of Floral Designers. The bouquet is available on 1-800-Flowers now. It was a heartwarming way to end a great season for a great new show. Congrats to CBS and 1-800-Flowers for a very entertaining evening! I think that it is wonderful that Mr. Chris McCann did such a wonderful think for Dee. I watched undercover boss and have always wanted to be a florist. I live in lansing mi and want to know how can i work for 1800flowers and become a florist. I am very artistic have great style and can do this.